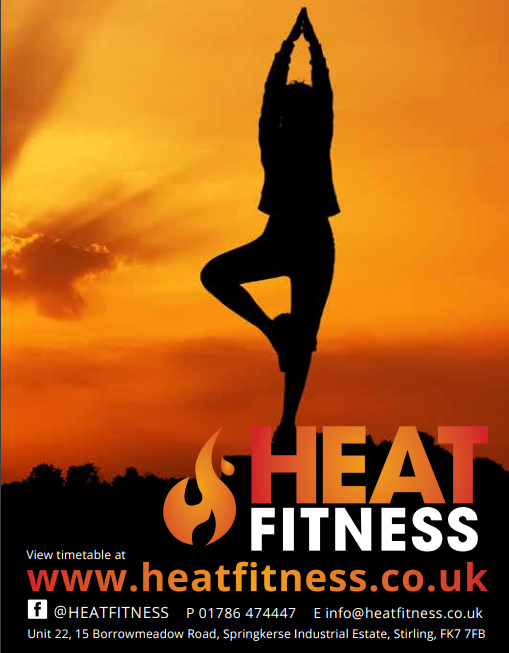 Lauren said: ‘We saw the advert for Heat Fitness in the Love Local magazine last January. A friend had told me about Hot Yoga but I couldn’t find a class in Stirling. I was looking for something to help with work life balance. Truthfully, Craig came along just to support me as I did not want to go by myself. We both loved it immediately and Craig ended up staying and chatting for over an hour with Jack about yoga. Since we started hot yoga nearly 12 months ago, we’re much calmer, happier, but still focused. We’re both stronger and fitter, and for me more flexible, with better balance than I have ever had.This is also the first time we’ve successfully exercised together for longer than a week. Earlier this year we both took part in a 30-day hot yoga challenge. It challenged us both mentally and physically but we were in it together and there was also a really lovely group of people doing it at the same time – so there was a real collective and supportive spirit. Before we started TRX, we weren’t completely convinced that it would work for us, but within a session, we could feel the difference and it’s now part of our regular schedule. It’s made us stronger, more stable and fitter and is a fantastic compliment to the yoga. The strength and core stability gains in TRX help the strength poses of Yoga, the balance and flexibility gains in Yoga help with stability in TRX. Over the last year, our body shape, core strength and definition has changed significantly, we’re both leaner than before. In the last year, we’ve been to other hot yoga and TRX classes around the world, whilst on holiday, and the confidence to do that has also come from yoga. I personally would never have thought I would go to a yoga class in a city I didn’t know 12 months ago. We love the variety of the classes, Bikram, Fierce Grace, Absolute, Yin/Yang and (Craig particularly) Power Yoga.It keeps it fresh, in addition to focusing on slightly different areas. We now don’t see a future without Hot Yoga, TRX and Heat Fitness…! Well we do, but it would be very grumpy.